Product Availability: Orders normally ship within 1-3 business days. Package Content : Six soft contact lenses in sterile buffered saline solution containing 1% Copolymer 845. 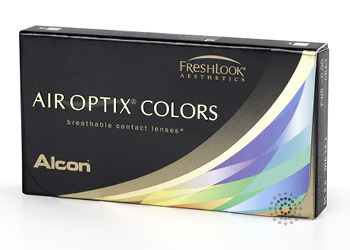 Air Optix® Colors contact lenses, manufactured by Alcon® in this six pack format, are the world’s first silicone hydrogel colored lenses. They will deliver up to five times more oxygen to the cornea as compared to other competitive products in this market segment. The colors are not printed on the surface of the lenses but rather locked within the lens material itself. The benefit is that nothing will interfere with the lens’s patented moisture system nor will your eyes ever come into contact with the colors. What you will experience is great all-day comfort and a beautiful and natural color change for your eyes. Air Optix® Colors is designed for wear on a monthly schedule. This means that they can be worn up to 30 days on a daily wear basis and replaced for fresh lenses at least once per month. Nine great colors are available Pure Hazel, Blue, Green, Gray, Brown, Honey, Brilliant Blue, Gemstone Green and Sterling Gray to change your eye color. Be sure to follow your eye doctor’s recommended replacement schedule. As an added benefit for those wearers who currently wear the regular Air Optix® lenses, ask your eye doctor if you can transition to the colored lenses.